the difficulty in separating and quantifying the metallurgical variables. One of the developing applications is represented by electromagnetic sorting (structuroscopy) , mainly used for parts and products grading. The object of this work is to establish the influence of the mechanical fatigue on the magnetic properties of SAE 4130 steel used, for example, in manufacturing shafts for steam-turbines, in order to make predictions on the working life of the parts manufactured from this steel on the basis of nondestructive measurements. The samples were made from SAE 4130 steel with the following chemical composition (%wt): C=0.4; Mn=0.75; Si=0.2; Cr =1.1; Mo=0.25. The mechanical parameters of this steel are: yield strength 750 MPa, breaking strength 950 MPa and Brinell hardness 240 HB. The steel produced under industrial conditions was subsequently hot rolled. The steel presents a ferrite-pearlite bi-phase structure with an average ferrite concentration of 14.5%, established by metallographic analysis . (figure 1). The samples were also studied by x-ray diffraction, analyzing the 110 and 220 lines by means of molybdenum Ka radiation. The x-ray analysis revealed that the average size of the mosaic blocks is about 670 Å and the 2nd and 3rd order microstrains are practically zero. The shapes and dimensions of the samples used in the fatigue tests are given in . The fatigue tests were performed with a cyclical rotating bending machine with two loads: 135 MPa and 150 MPa. The microcrack arrays specific to fatigue appear after 2.5 million cycles for the 135 MPa load and after 1 million cycles for the 150 MPa load. 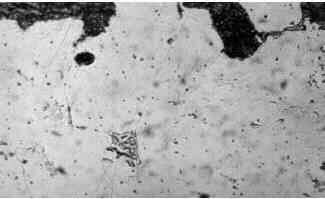 The fatigue microcrack array was rendered evident by means of fluorescent penetrant liquids. From the central zone of the sample a torus was manufactured with an outer diameter FOUT=10 mm, inner diameter FIN=8 mm and height h=2 mm; the torus was used to measure the hysteresis loop at 50 Hz. The coercive force of the samples with different fatigue states was also determined using the nondestructive method of magnetic incremental permeability , . The basic diagram of the device we used is given in figure 2. The sample was subjected to the simultaneous action of two magnetic fields: a triangular one with the frequency f=0.1 Hz created by a U shaped Fe-Si magnetizing yoke which ensures the sample remagnetization according to the major loops, and a sinusoidal field with the frequency ranging between 1 kHz and 10 kHz inducing minor reversible loops superimposed on every point of the major hysteresis loop. The incremental permeability represents the slope of the minor loop resulting from reversible phenomena (figure 3). A good correlation was found between the values of coercive force established by the hysteresis loop method and the incremental permeability method respectively, as can be seen from the results presented in figure 4. The way in which the saturation induction and the coercive force change depending on the number of fatigue cycles was determined for two loads, namely 150 MPa and 135 MPa. The results obtained are presented in figure 5. As a general tendency, one notes for both loads a decrease in saturation induction and an increase in coercive force with the increase in degree of fatigue characterized by the number of cycles. The saturation magnetic induction and the coercive force of the samples were the same after 0.5x106 cycles at 150 MPa load and 1.5´106 cycles at 135 MPa load. 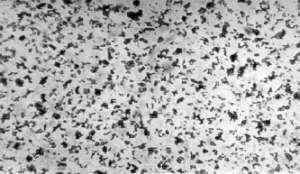 The size of the mosaic blocks became about 200 Å, which shows an increase in the number of dislocations, and the 2nd and 3rd order microstrains became 0.38´10 -3. The saturation induction decrease due to carbon loss in the ferrite grains caused the decrease of specific magnetization of ferrite grains and implicitly of the whole sample. The ferrite concentration increased to 15.2% (figure 6). The increase of the coercive force results from the occurrence of carbon on the inside of the ferrite grains, as can be seen in figure 7. After 106 cycles at 150 MPa load and 2.5´ 106 cycles at 135 MPa load the crack array characteristic to fatigue appears. The mosaic block are about 670 Å while the 2nd and the 3rd order microstrains are virtually zero. The ferrite concentration increases to 20.4% (figure 8). 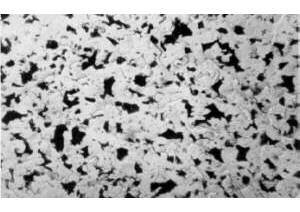 Fig 8: The microstructure of SAE 4130 steel after 106 cycles at 150 MPa load and 2.5´106cycles at 135 MPa load, (´100) Fig 9: The microstructure of SAE 4130 steel after 106 cycles (150 MPa) and after 2.5´106 cycles (135 MPa), (´600). The amplification of carbon diffusion can be noticed. 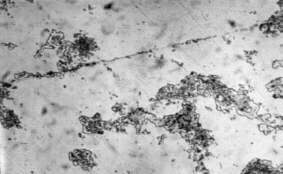 The absence of microstrains and, by implication, internal stresses is due to their relaxation as the result of the increasing number of cycles. Following the carbon diffusion into the boundary of ferrite grains, the saturation induction decreases and the coercive force increase (figure 9). When the fatigue microcrack arrays appear, the saturation magnetization and the coercive force of the samples subjected to the two loads are practically the same, which suggests that these magnetic parameters can be used to predict the fatigue state. The coercive force was determined by the nondestructive method of incremental magnetic permeability which can therefore be used as a method for fatigue state prediction. The fatigue state of SAE 4130 ferromagnetic steel created by a cyclical rotating bending machine leads to a decrease in the saturation induction as a result of carbon diffusion through the boundary of ferrite grains, and simultaneously to an increase in coercive force. 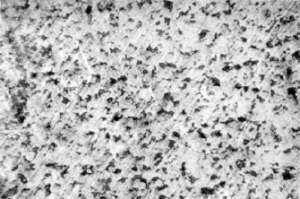 When the coercive force of the samples subjected to mechanical fatigue exceeds 590 A/m, a specific microcrack array may appear. The coercive force measurements by means of the nondestructive method of incremental magnetic permeability permits a prediction of the fatigue state of parts and assemblies manufactured of this steel.